So, after my lovely experience with Blood Pudding/Black Sausage/Nasty Stuff, we headed out of Galway. 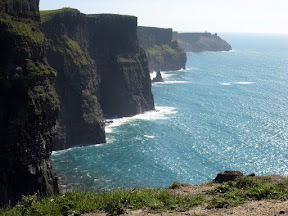 Our next area of visitation is the Cliffs of Moher. On our way there we saw some gorgeous countryside. We pulled over a few times and took pictures. One time we pulled over where we saw a bunch of cars near a lake. The tide was out so it was kinda smelly, but apparently that’s a great time to go crab fishing. We watching some kids do just that, and it was pretty cool to watch. We went through a little cute town called Lisdoonvarna. I remember it being very colorful. We ended up stopping in Doolin for lunch. There were a lot of people packed into this tiny town of population 200. We walked into a couple shops there before we went to grab something to eat. 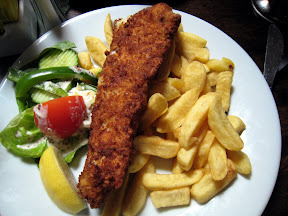 We had the best fish & chips in a pub here. The Guinness wasn’t half bad either. Man, my mouth is watering now. After we finished eating it was time to start looking for some place to stay. We had one in mind we wanted, and drove over there to see if there were any vacancies. Unfortunately, other people must have had this idea too, but much earlier than us, because they were full. But, the lady pointed us to across the street to a B&B her cousin or niece owns. We went there and sure enough, we got a room. This place was very nice, but nothing beat the view we had here. I think it might have been this cozy place and the stellar view where I first got the feeling of “I could live in this town”. Mmmmmm, just give me a moment. Even the thought of it just sends me back there. Gorgeous, cozy, no stress. Mmmmm. OK. Back to the business at hand. We dropped off our stuff there, rested for a sec, freshened up, and then headed out to the Cliffs of Moher. Since Mike had been there in October, they had changed the tourists area just a wee bit. The visitors center is now built into the side of the cliffs. Very unobtrusive. Inside was a gift shop, a cafe, and a self-paced tour called “The Atlantic Edge”. The self-paced tour did cost an additional fee, and while I would not say that the tour is necessary, Mike brought up a good point and said it does help fund them. The cliffs themselves were just amazing. Literally, breathtaking. We then headed over to The Burren. An area that is completely limestone rock. We walked out to the shore and had a blast trying to take pictures of the waves as they crashed up. Afterwards we went searching for some place to get a meal. This would continue to be our dilemma while in Ireland. Generally we eat late as it is. However, with the sun setting at 10pm, our sense of time was just whacked. We would generally be trying to find a place to eat after 9pm. Everything closes at 9pm. We always did find places, but geeeeeeez, what a hassle. 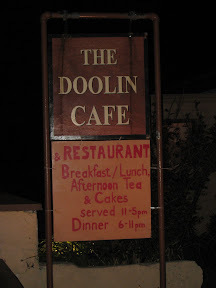 In Doolin, we found a place called Doolin Cafe. It was run by an Italian girl and a South African guy. The guy was the cook and the girl was the waitress. I had a steak dish and mike had a spinach and goat cheese risotta. We both loved our meals. We talked with the owners a bit afterwards and they sounded like some very cool interesting people. They had just taken over the restaurant 6 months ago. I hope they do well! Whew! The next day, we continued to head south. We experienced some interesting roads along our way, of course, and then hopped onto a ferry to cross the River Shannon. After more driving and random stops we entered the Ring of Kerry. It sounds weirder than it really is. It’s basicd ally a road that goes in a loop around this particular area of County Kerry. Now this sounds odd to say about a country that is so scenic it’s just not natural (heh! ), but this had to be the most scenic area I’ve ever seen. Such pristine natural beauty that seems to be truly cherished and well taken care of. Absolutely amazing stuff. We ended up in Cahersiveen for the night. This time, we almost kinda sorda went looking for dinner at a more appropriate hours. Like 8. We read our travel guides and both mentioned a particular restaurant in the area, so we figured if they both agreed, then we would give it a try. After just a little drive, we arrived in Waterville to eat at The Smuggler’s Inn. It’s located near the entrance of a famous golf course and literally just a stone’s throw from the ocean. On the outside it just looked like a typical brick pub building. However, upon entering, we quickly discovered that our t-shirts and scuzzy jeans might be a tad bit underdressed. But, we needed to eat, and it wasn’t too busy, so we soldiered on. You couldn’t ask for a more gorgeous view while you’re eating. Just spectacular. 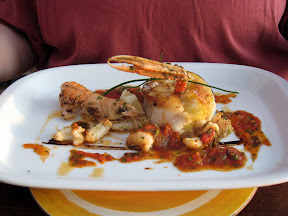 I had a cod & scampi dish and Mike feasted on halibut. Both were very good dishes, but I think I liked Mike’s just a tad bit more. The service was excellent here and the people were super friendly. Afterwards we ordered an irish coffee, and a bailey’s coffee. While waiting for that, Mike headed out to the patio area. After paying and getting our coffees I headed out to sit with him out there. It was chilly, but so relaxing and enjoyable, and with out coffees it took the chilly edge off. The next day saw us complete the Ring of Kerry while seeing some of the most insane views ever. The fog was heavy and low in some areas but it just made things seem that much more mystical. 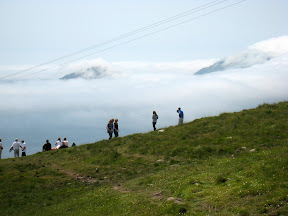 While on top of this large hill/mountain, I was looking out to the ocean and could see the top of one of the skelligs peaking out of the low clouds/fog. Mike walked in a different direction to get some pictures, and I stayed up there just in complete awe — while wearing a “Keep Austin Weird” t-shirt. You may think this is an odd bit of information. Why would you care what I was wearing? Well, I’m getting there, so hush. While standing there in my gorgeous shirt, a girl came up from behind me and said “So, you’re from Austin?”, I confirmed, and then she told me she and her two friends just graduated from Texas A&M. Seriously small world. Especially if you consider that I may live in Austin, but I’m an Aggie through and through :D We continue on and see some insane views. Ok, I’m posting this now. 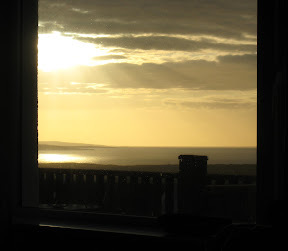 I promise to be speedier about the final installment of our Ireland adventure.